Jim McVittie’s desire to help others led him to start his own law firm in 2000 to focus on estate planning issues. Previously, Jim spent many years practicing workers’ compensation litigation. A native of Washington state, Jim received his undergraduate degree in Political Science from Washington State University in 1984. In 1984 Jim moved to Portland to attend law school at Northwestern School of Law at Lewis and Clark College, receiving his Juris Doctor in 1987. Bachelor’s degree in Political Science from Washington State University, Pullman, Washington. Juris Doctor from Northwestern School of Law, Lewis and Clark College, Portland, Oregon. Jim enjoys boating so much that he purchased a boat to live aboard. 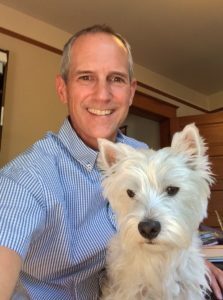 Jim is involved in the local community serving on the Board of Directors for the Portland Gay Men’s Chorus (PGMC), The Ruby Red Flippers scuba diving club and Diving for Life, an international LGBTQ scuba diving organization. Jim also enjoys a variety of outdoor activities like camping, hiking, and skiing.